I read this book over the days I spent commuting to and from work. April/May is a time in Europe and Australia (and elsewhere?) when we are remembering our war dead. In the Netherlands it was a couple of days ago when the liberation of the country by predominantly Canadian forces at the end of World War 2 was celebrated. In Australia, April 25th is ANZAC Day, when we remember the ill-fated invasion of Turkey at Gallipoli (Gelibolu) by allied forces in The Great War. ANZAC Day is an opportunity for us to remember all the people who have been affected by war up to the present day, it is usually quite sobering and these days I cannot attend a service or march through the city without sobbing loudly. I think of my Dutch family’s wartime history, the childhood my Father and Uncle had that was ruled by fear and hunger. My Opa and another Uncle taken to work as slaves in Austria. The disappearance of yet another Uncle for three years and the heartache my Oma must have had, thinking and worrying about him- sobering indeed- and this is just one family. Lately however, my thoughts have turned towards my Welsh Grandfather and his experiences as a Gunner on the Western Front in France in The Great War. My Mother says he made his wartime service sound like a lot of fun, but I think somehow that being gassed twice and serving for the duration was anything but, his was a generation of men who did not talk much about the bad times. Some of my questions have been answered by this book. 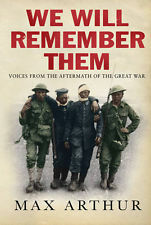 We Will Remember Them is a collection of anecdotes and thoughts from men and women, mothers and fathers, sisters and brothers about their experiences in the First World War, The Great War, The War to end all Wars (unfortunately not). As I wrote before, I read it commuting and often found myself crying, smiling, sniffing and anything in between. I experienced so many emotions reading people’s thoughts that I was often exhausted after a ten minute train trip. I don’t have much to say really, I recommend this to anyone who has had a family member who has fought in a war, or an interest in twentieth century history. There are no holds barred in the descriptions of the dead and maimed; but there is also outrage at the treatment of these ex-servicemen and women and/or their families after the end of hostilities and the loss of a generation of young men who never married the young women they left behind, the families they never had, the opportunities missed. There is also comment on the Versailles Treaty which contributed so much toward the rise of Nazism in Germany and ultimately, the Second World War. This book includes all opinions. Some men found life in the army (and fighting) a wonderful, empowering time, a time of cameraderie not equalled since; others were left embittered at lost opportunities and a lifetime of hardship due to injury, or lack of education, or the changed world. One thing was constant however, that War changed everyone. The eloquence of the old soldiers and thier families talking about the horrors they lived through during and afterwards, makes me wonder what has happened to the vernacular where the lowest common denominator rules and nowadays we abbreviate, OMG, LOL, LMAO etc etc- are we any better off…really?